In one third-grade classroom: No girls allowed! 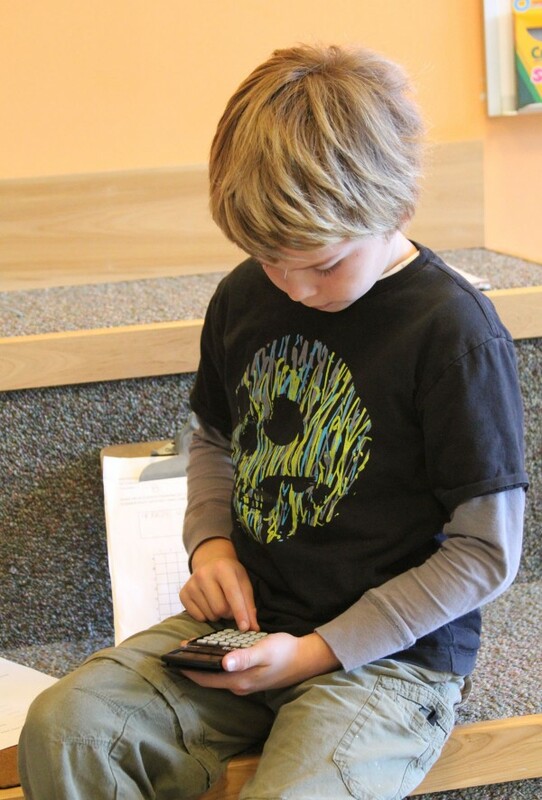 Gabe Ruesswick, 8, of Camden, types numbers in his calculator to determine how many objects he and his classmates found at a staged archeological dig site. Ruesswick is in an all-boys third-grade class in Camden-Rockport Elementary School. Cameron Hedstrom, 8, of Camden, practices writing the letter "I" in cursive while sitting on a bouncy ball. The ball is one tool in the Camden-Rockport Elementary School's third-grade boys-only class that helps students focus. Oscar Horovitz, 9, of Rockport, blows sand off a stone he and his classmates found at a staged archeological dig site. The students in the all-boys third grade class then had to count all the artifacts. ROCKPORT, Maine — Teacher Steve Seidell’s third-grade classroom is a bit louder than everyone else’s in Camden-Rockport Elementary School, but that’s OK. The 18 boys in his male-only class seem to be more excited, more engaged and enjoying school more than they did before. It’s the school’s first shot at a single-gender classroom and so far it’s going well, according to Seidell. It may be the sole boys-only class in the state but that’s a difficult claim to make because the Maine Department of Education doesn’t keep records on that information. The major difference between the all-boys class and the two other third-grade classrooms isn’t the material taught, but the environment. The class can get very noisy. Boys are allowed to get up, move, do their math while lying on the floor if they need to. Sitting still isn’t their strong suit, and according to Seidell, he is trying to teach to their strengths. Sitting is not a requirement in Seidell’s class. The boys more or less move about freely. 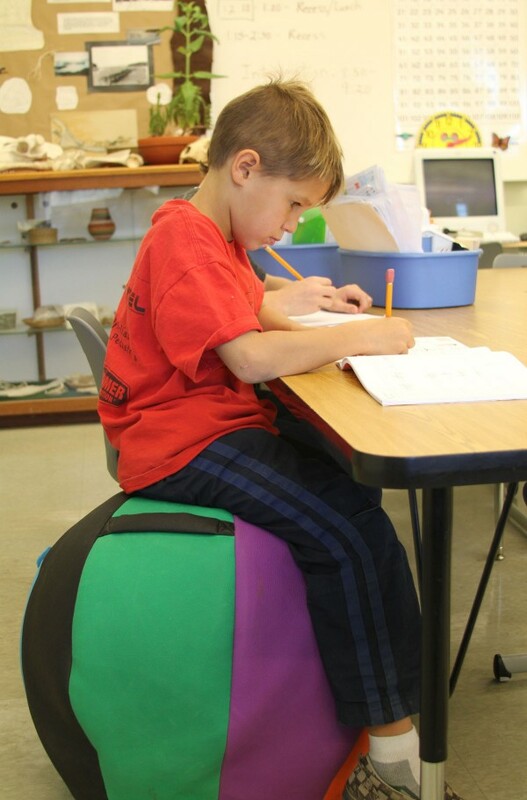 The class even has a yoga-type ball that a child can sit on and bounce as he works if it helps him focus. To help the boys concentrate, the school also each a pair of sound-blocking headphones and a little corral around their desk so they don’t have to see or hear anyone else if they don’t want to. Even the set up of the room is geared toward boys. It’s full of stuff — computers, a turtle tank, a plant tank, bookshelves, sand trays, sinks and boxes of bones. “It’s all part of the hook. They go crazy over all the stuff,” Seidell said. It isn’t always boisterous in the class. A recent Friday morning started out quiet as the boys filed in one by one and looked at the white board for instructions. They then put their coats away quietly, sat down for some math problems and each took a turn writing their spelling words in a pan of sand. It took Seidell weeks to get into this smooth morning flow, but the experiment seems to be working. The boys already had dug up artifacts from the school sandbox, re-created the dig site inside the school and mapped the artifacts on paper charts. On Friday the boys had to categorize artifacts and count them. The rubble was supposedly from an early Native American site. The lessons touch on a variety of subject areas — math, social studies, science, related reading and motor skills. Interactive group projects work best for the boys, Seidell has found. Oscar then gave a dissertation to his peers about how Native Americans used to grind food using rocks. “They make weapons out of bones,” added Timothy Hayden, 8, of Rockport. Meanwhile, his classmate Noah LaChance, 8, of Camden pawed through charcoal artifacts, counting them. “25!” he said. All the boys wrote down the new tally on their charts. That was the last piece of missing information. The boys added up all the other categories and they all called out that there were 41 total artifacts. Then they wrote down the fraction 25/41 for how many of the total artifacts were charcoal. “Well, it takes a little bit of math,” acknowledged Gabe Ruesswick, 8, of Camden. Gabe is happy to be in an all-boys class, mostly because his friends are all in his class with him. He doesn’t have any friends who are girls. Plus, he feels like he is learning more. “For some reason girls learn at a different pace. I’ve seen it. Not faster or slower, just completely different,” Gabe said while filling out his school worksheet. His classmate Dillon Mackey, 8, of Rockport felt the same. Part of doing better, Dillon said, was being interested. So far this year, lesson plans have been based on subjects he’s already interested in: turtles, archaeology and the ice age. This engagement of pupils is essential, according to educators. “70 percent of all dropouts in Maine are boys. 70 percent [of students] sent to detention are boys. 70 percent of all our top students in Maine last year were girls. We’re not meeting the needs of our boys. I’m concerned about it,” said William Shuttleworth, the district’s superintendent, while speaking at a recent education forum. When the idea sprung up for a single-gender classroom, the school asked if parents wanted to be a part of it. Within weeks, there was a waiting list. Amanda Fisher’s son made it into the class, but she was hesitant to put Bryler there. Bryler is a bit on the quiet side and she didn’t want him to be influenced by more rambunctious boys. She found that Bryler hasn’t become more rambunctious, but he has begun to be more assertive about voicing his opinion. While creating a single-gender classroom is innovative, the big reason the K-4 school is trying a boys-only class is because two-thirds of the third-graders this year were boys. Creating a boys-only room helped even out the other two classes. This may sound like a fluke, but according to Seidell, something is in the water in Camden and Rockport. The kindergarten this year has more than 40 boys and only 15 girls. The first grade is made up of one-third boys and two-thirds girls. If this sort of model works, the school might use it again. But Principal Theresa Lash isn’t so sure. For her, it’s not about gender. “We have to look at each set of kids and see what’s right for them. Next year do we need an all-boys first-grade class? It depends on the kids. A quiet boy might not do so well in here. It’s not as much about gender as it is about learning styles,” Lash said. The girls in the third grade at Camden-Rockport Elementary are now in gender-balanced classes and, according to Lash, get the same type of learning opportunities as the children in the all-boys class. It’s not the material that’s different, it’s the environment. 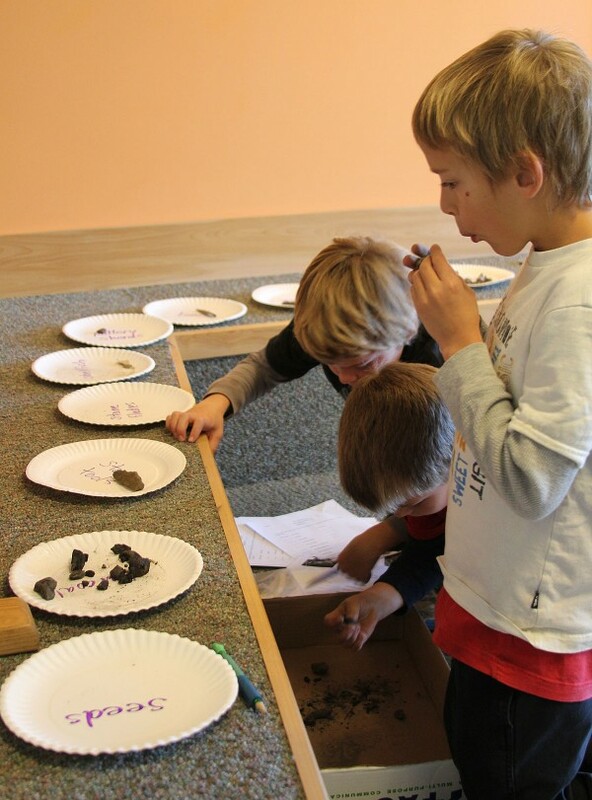 To make this happy classroom of active, chatty boys engaged in real-life scenarios, such as an archaeological dig, is a ton of work, according to Seidell. “I love teaching. I love all my classes. I’m getting a kick out of this one. It’s just a lot of work. I wish I were younger,” said Seidell, who has been a teacher for 34 years. He does get some help. In the afternoons, education technician Jan Albright pops by. She has known some of the boys since they were in kindergarten and has seen a change in some of them. “They’re happier here. They’re succeeding now. When you ask them how they are doing they say, ‘great.’ They used to say, ‘I hate it here,’” Albright said. All the evidence that the class is working is completely anecdotal. “It’s too soon to tell how it’s going in terms of academic outcome, but the boys are motivated and excited, absolutely,” Lash said. The school will monitor the program to see how well it works. In January the school will decide what is next for the third-grade boys. There have been discussions about Seidell following them into the fourth grade, but nothing is firm yet.